ℹ The KZ ED15 has just been officially announced and is now available to buy it. 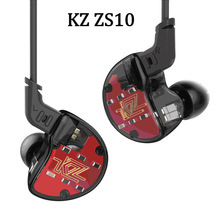 On March 1st we informed you about KZ having launched 11 new headphones, last week the KZ ZS10 was introduced to resellers and since then it has been available to be pre-order (You can order the KZ ZS10: here). From today KZ fans have the pleasure to be introduced with a new model the KZ ED15 which can already be purchased from the link below. The KZ ED15 is actually the KZ YZ49 that was announced on March 1st, a dual driver hybrid headphone with 1 dynamic driver and 1 balanced armature and metal construction. Knowledge Zenith decided to follow a very logical naming by making the KZ ED15 (ex KZ YZ49) part of the ED line of their earphones, which all share non-detachable cables (besides the KZ ED12 ) and some have offered excellent bang for buck performance like the KZ ED9 (an earphone with replaceable nozzles), KZ ED7 (a bamboo earphone) and classics like the KZ ED4 or KZ EDR2 . The technical specifications that we shared with our readers on March 1st are now re-confirmed on the KZ ED15.